Julieann Covino, founder of Cambridge-based Jace Interiors, says that with spring on the horizon, now may be the perfect time to restructure one of the most underutilized fixtures in the home - the closet. When Covino's clients express dissatisfaction with their current closet situation, the interior designer suggests getting an organizing system. Closet organizers come in all sizes and finishes, with heights and fixtures that vary, and price points that are all over the map. "So when someone is starting this process, they should really take a few days to figure out what their needs are," says Covino. There are a number of factors to consider before selecting a closet organizer. First, Covino talks to clients about how they use their closets. Are they storing many folded items or a lot of shoes? Do they have an abundance of long coats or dresses that need to hang? She then recommends taking everything out the closet so they can actually see the space they are going to reconfigure and then decide what will be tossed, given away, or placed in storage. Covino also asks clients to name their biggest complaints about their current closet. Is it that they can never find their sweaters? Maybe they need more shelves than rods. Thinking through such gripes can help you figure out what you need and how you can put your closet together in union with what you have already, she adds. Abbey Koplovitz, an interior designer who owns her own firm, AbbeyK Inc., in Belmont, asks clients if they want to be able to see everything in their closet or not. "Some people want their stuff behind cabinet doors, but others believe that if they can see everything, they'll be able to find their stuff," she says. "That can drive the kind of look you're going for." Still, there is the person who does not know where to begin and cannot possibly visualize an end result. In that case, the individual should consider the custom design of a retailer like California Closets, says Koplovitz. Her clients often work with California Closets, which usually sends a consultant to customers' homes to help them design a concept and then actually builds it. "California Closets has a great way of helping clients visualize what their needs are and what the solution is," says Koplovitz. "They make you feel like a fancy person in Hollywood." Covino raves about EasyClosets.com, which allows you to custom manufacture your own closet online and then ships the product to you. "You can create it all yourself, see 3-D pictures, then save it, and come back to it in a few days if you want," she says. Although you have to do the installation yourself with the EasyClosets option, Covino says "if you can use a hammer and screwdriver, it's pretty easy to install." Another option is the wire closet organizing systems that can be found at many home-improvement stores, but lack a custom feel. There are great options at every price point, says Koplovitz. You can spend anywhere from a few hundred dollars to $10,000 or more. "It's just really a question of budget and priority," she adds. n Sort it out: As you take stock of your closet, try to arrange your clothes by category, grouping pants, shirts, suits, and dresses. Depending on your wardrobe, you can also separate casual clothes from those you wear to work. n Where to shop: Retailers like Home Depot and Lowe's offer wire closet systems from ClosetMaid. For higher-end, custom designs, check out California Closets (calclosets.com) and EasyClosets.com. n Doors: Consider a door that is hinged in the middle, which gives you better access to your entire closet. n Light it up: If you are working on a closet that you will use on a daily basis, it is a good idea to consider some sort of lighting. Overhead lighting is particularly important if you have a walk-in closet or a dressing room. 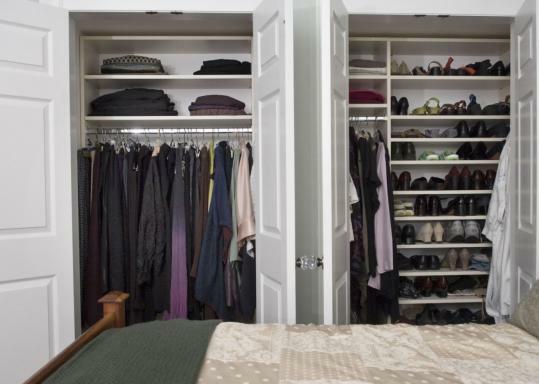 n Finish: If you have a smaller closet, it is better to go with a lighter finish. If you have, say, a dark wood in a small space, it will be tougher to find your items.